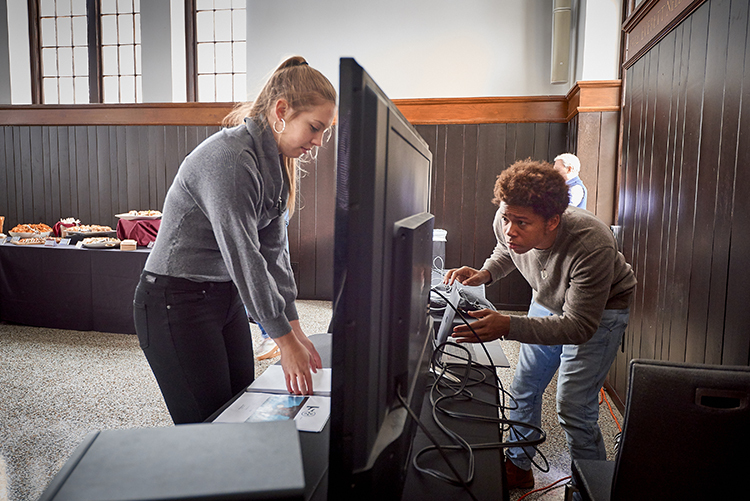 For Brandon Doby ’18 and Lauren Sanderson ’18, entrepreneurship exists at the intersection of business acumen and creative risk. 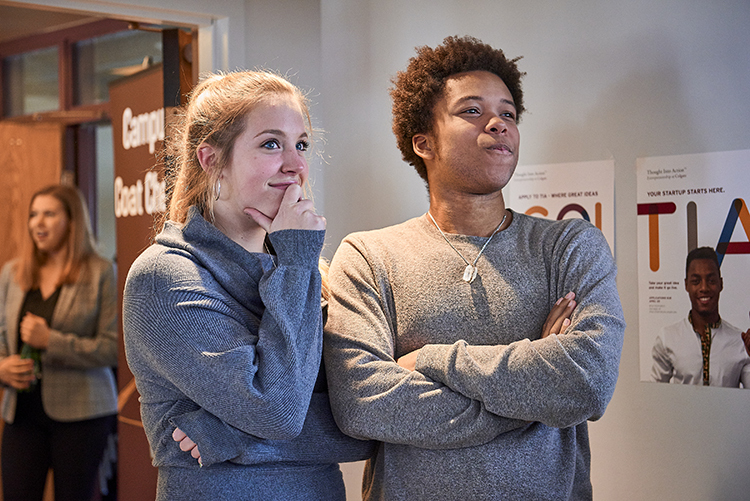 These two seniors are both artists and business owners: They created ISO Film, a production company, as a Thought Into Action (TIA) venture in 2016, and have been making experimental films together ever since. 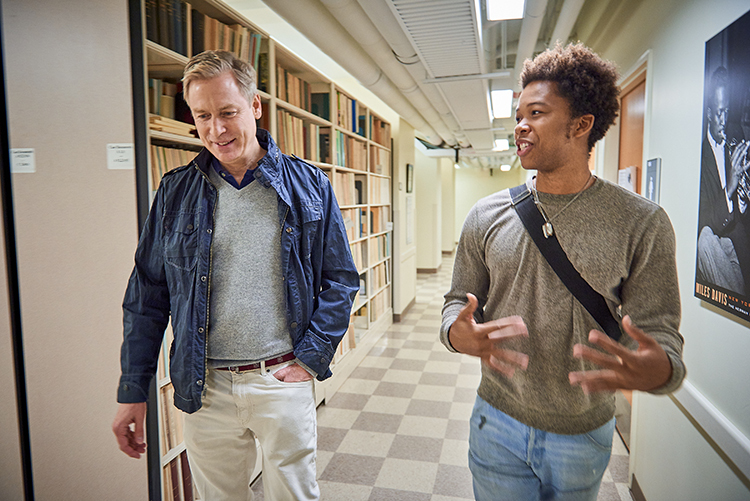 “To sustain yourself as an artist and to give yourself the opportunities to create exactly what you want to create, you need to master the business side, too,” said Doby, a studio arts major from Chicago. 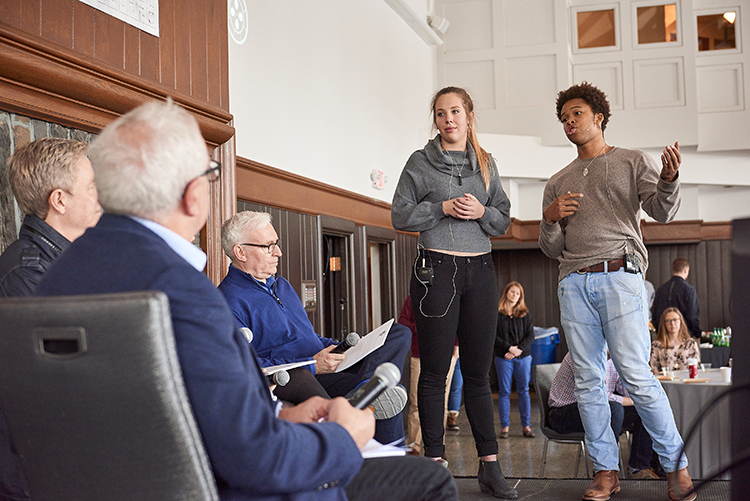 Doby and Sanderson’s business venture took center stage during Colgate’s annual Entrepreneur Weekend April 7. The day was packed with pitching and networking, and it contained a few surprises for the pair. While other student entrepreneurs arrived at the Hall of Presidents to set up their TIA booths, Sanderson and Doby had an impromptu breakfast meeting with Jeffrey Sharp ’89. A panelist during the event’s Shark Tank­­–style pitch competition, Sharp is a successful filmmaker who is known for Boys Don’t Cry and Proof. The pair gave Sharp a tour of the state-of-the-art audio and video studios they use on the first floor of Case-Geyer Library. Before the studios were built, aspiring musicians and filmmakers like Sharp had to get creative with what Colgate had to offer. Doby and Sanderson put the finishing touches on their ISO Film booth. The pair had clips of their previous projects — including music videos and experimental shorts — rolling on a TV screen and copies of screenplays on the table for visitors to look through. ISO Film has two branches: ISO Works and ISO Labs. Through ISO Works, Sanderson and Doby take on commissioned projects like event coverage and music videos. Those paid projects help fund ISO Labs, which is the more experimental side of the business; through ISO Labs, the pair have directed several short films and recently finished a documentary. For this partnership, the main event was the Shark Tank-style competition. Doby and Sanderson gave a concise and compelling pitch to the panel of four “sharks” under a strict time limit — an ominous gong sound-effect rang through the Hall of Presidents when were up. The panel of “sharks” deliberated and awarded $1,000 to ISO. Sharp, however, had his own gift to give the ISO team: The filmmaker announced he would commission ISO to work on a small project for his production company. Doby and Sanderson also won a $13,000 grant through the Colgate Entrepreneurs Fund. The program awards student-entrepreneurs with a seed grant, incubator space for the summer in Hamilton, and mentorship from experienced entrepreneurs. Doby and Sanderson plan to move to Los Angeles together to grow their company, which has recently been incorporated in California. Also, Sanderson has another creative outlet — her book of poems, published through Write Bloody Publishing, comes out next March, which will be followed by a 20-stop book tour. “I love that feeling of no net. No matter how big the checks get, there’s a no net sense of individual entrepreneurship that I think drives a lot of great art, because there’s a sense of survival in it,” Doby said. Thought Into Action Student Incubator applications are due April 20.